Saturday, January 14, 2008, Habib Khan Indian Jazz Ensemble with Pandit Habib Khan (sitar), Matthew Montfort (scalloped fretboard guitar), Vijay Ghate (tabla), Dr. Kadri Gopalnath (South Indian saxophone), and John Waller (drum set), Golden Jubilee Celebration, IIT Bombay, Powai, India. 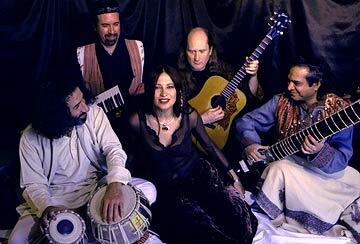 Friday, February 29, 2008, 8:30 pm, Ancient Future Trio featuring Matthew Montfort (scalloped fretboard guitar), Mariah Parker (santur), Faisal Zedan (Arabic percussion), and belly dancers Soonyana and friends, French Garden, 8050 Bodega Avenue, Sebastopol, CA 95472. Adm: $18 adv, $25 door. Call 707-824-2030 for more information. Friday, June 6, 2008, 8 pm, Ancient Future featuring Matthew Montfort (scalloped fretboard and fretless guitars) Mariah Parker (santur and hammered dulcimer, keys), Faisal Zedan (Arabic percussion), and Mark Bell (percussion), Kosmos Music Camp, Camp Cazadero, CA. Contact matthew@kosmoscamp.com. Sunday, July 20, 2008, 2:30 to 4 pm, Ancient Future Trio featuring Matthew Montfort (scalloped fretboard guitar), Mariah Parker (santur), and Arshad Syed (tabla), Santa Clara Central Park Pavillion, Kiely Blvd. & Homestead Rd., Santa Clara, CA 95050. Free. Friday, August 15, 2008, 8:00 pm, Ancient Future Guitar-Sitar Jugalbandi featuring Pandit Habib Khan (sitar), Matthew Montfort (scalloped fretboard guitar), and Arshad Syed (tabla), Great Basin Arts and Entertainment, Martin Hotel, Railroad & Melarkey Streets, Winnemucca, NV 89445. Adm: $15 at The Martin Hotel (775) 623-3197 and Nature's Corner (775) 625-4330. Email contact@gbae.org for more information. Saturday, August 23, 2008, 5:00 – 8:30 p.m., Ancient Future Trio featuring Matthew Montfort (scalloped fretboard guitar, glissentar), Mariah Parker (santur), Joe Fajen (tabla, percussion), Swarga Dwari, Himalayan Designs Garden, 1660 Old Airport Road, Auburn, CA 95602. Suggested donation: $30 per person to Ama Foundation. Free admission for children. RSVP by August 17, 2008 to 510.847.2889 or info@ama-foundation.org (If you make a last minute decision please come anyway). Sunday, October 5, 2008, 3:45 - 6:15 pm, Ancient Future Indo Latin Jazz Ensemble performance featuring Matthew Montfort (scalloped fretboard guitar), Mariah Parker (keyboard, santur), and others, Sonoma County Harvest Fair, Sonoma County Fairgrounds, 1350 Bennett Valley Road, Santa Rosa, CA 95402. Adm: $6. Contact the Sonoma County Fair at 707-545-4200. Sunday, October 12, 2008, 8 to 9 pm, KKUP World Music Marathon, 91.5 FM, 1241 Franklin Square, Santa Clara, CA 95050. Live on the air. No webcast. Wednesday, October 15, 2008, 2 pm PST/5 pm EST, Karmacaffe. Live webcast interview with Matthew Montfort. Increase your rhythmic skills by learning world rhythms! Taught by Matthew Montfort of Ancient Future, from his book Ancient Traditions -- Future Possibilities: Rhythmic Training Through the Traditions of Africa, Bali and India. Friday, June 6-Sunday June 8, 2008, Indian Music Ensemble, Kosmos Music Camp, Camp Cazadero, CA. Contact matthew@kosmoscamp.com. What you will learn if you attend one of the workshops? Find out in this world rhythm training presentation of African, Balinese and Indian rhythm exercises, including MIDI and GIF file examples. Curious about what Ancient Future sounds like? Download sound files of the group's music from the on-line catalog of Ancient Future recordings and books. Ancient Future isn't performing near you? Check out the booking information for hosting an Ancient Future concert or world rhythms workshop in your area.